No matter how hard I try, I simply cannot see (or taste, for that matter) what all the fuss involving these little French cookies is about. I know I'm in danger of making the macaroon lovers around the globe (and quite a crowd it is, apparently) really angry, but I just had to say it. I mean, they do taste good enough, don't get me wrong. But there are sooo many better and tastier desserts in this world I'd indulge rather than macaroons. It is a matter of taste, of course, and my tastes are apparently a bit different than the majority of people. I never did fancy any kind of meringue really, now that I think about it. It's just way too sweet for me. And although I knew that macaroons wouldn't be any different, I still felt I had to give them a chance and see for myself why the world has gone crazy about them. This was the third time I made macaroons, each time hoping that I will somehow learn to like them more. Unfortunately, I just get disappointed every time. Their sweetness is just overwhelming, no matter how light, fruity or sour the filling is. I also must say that I was not very impressed with Claudia Flemming's recipe. I tried Pierre Herme's recipe twice and it worked really well. Those macaroons grew perfect little feet and had a really nice texture. And here's the evidence: Chocolate Ganache Macaroons and Lemon Cream Cheese Macaroons. Flemming's macaroons were, however, really fragile and had to be handled with an unusual amount of care or otherwise they would literally pulverize in your hand. It was just nerve wrecking! And the baking time was just too complicated for me: put them in, take them out, raise the temperature, wait a few minutes, put them in, wait some more... Oh boy, that lasted even longer than making them in the first place. And, for some strange reason, almost all of the macaroons from the last batch mysteriously cracked and generally looked terrible. The first two batches came out just fine. Go figure. One would think all my macaroon miseries came to an end there. However, the worst was yet to come. After I filled my little pink macaroons thinking that all is finally well, they just started melting after a while, believe it or not. So, as we speak they are slowly turning into a sticky, gooey pink...well, I don't know what to call it but it ain't a pretty sight. So right now I just about hate macaroons. However, I must admit that out of three different kinds that I've made so far, these macaroons look the worst but taste the best. Every cloud has a silver lining, I guess. :) Still, I don't think I'll be making macaroons again any time soon. Oh yeah, in case you were wondering, I made hazelnut macaroons with an orange mousse filling. 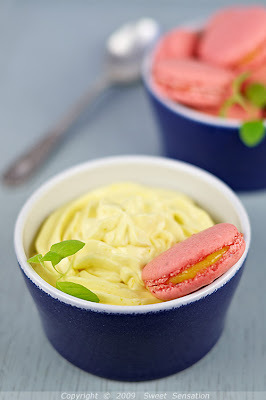 The base for the mousse was this orange curd recipe. I did everything by the book, from aging my egg whites to grinding the nuts (half almonds and half hazelnuts) with the icing sugar and letting the mixture dry up for 24h before using it. I used powdered food coloring and weighed all the ingredients precisely so I can't figure out what went wrong and why the macaroons are melting. Anyone?! Predobro izgledaju,oba puta su savrseno izasla.Još ih nisam napravila,pripremam se! I ja se nikako nakaniti napraviti te famozne maccarons. Dijelim tvoje čuđenje globalnom pomamom za istima, jer mi se čini već pri samom čitanju recepta, da oni svi ljepše izgledaju, nego što doticaj s nepcem isti ugođaj potvrdi. Ja osobno nisam ljubitelj kolača od bjelanjaka, moji favoriti su čokoladni moussevi i parfei, tako da sam tu u startu subjektivna. 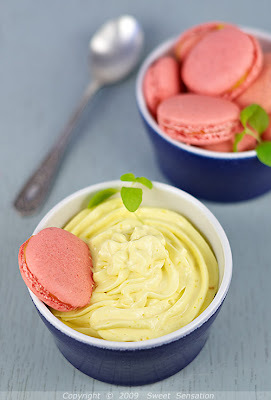 Naš pandan ili varijanta macaroonsa, tzv. puslice ili pusrle nikad kod mene baš nisu prolazile. Priprema je toliko delikatna i toliko toga može poći krivo, da mi se čini da je to stvarno vrsta slatkiša koja se radi samo i jedino kad imaš jako puno vremena, potpuno si smirena i samo se njima baviš. I can not force myself to make that famous macaroons. 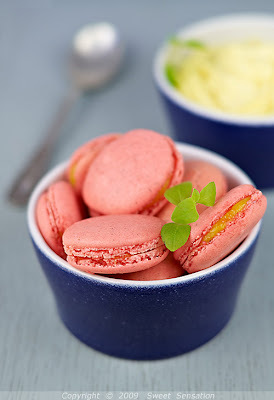 I also share your surprise at the global craze for them, because it seems to me, when I'm reading all the macaroon's recipes, they all look better than contact with the mouth the same experience confirm. our version of macaroons, so-called puslice or pusrle, never had my attention, so I have admitted that I'm subjective. Preparation is so delicate and so many things can go wrong, that it seems to me it is really kind of candy that you should make , only when you have enough time, when you are totally calm and focused only on macaroons, and that all effort, just as you said, do not justify the final result. Što se ovog recepta tiće nije ni meni jasno ovo fantaziranje s pećnicom?! vidim da si imala festu s pecnicom kao i ja. poluluda sam bila na kraju od tog pustog vadenja i stavljanja u nju. jos nekako ako imas veliku pecnicu pa ti sve stane na 1 ili dva lima ali kad imas malu to ide u nedogled. ja sam radila kakao, pandan ekstrakt i malina ekstrakt verzije. ona s kakaom mi je uspjela savrseno (cak nisu bili ni preslatki. valjda zbog gorkog kakaa) a one druge dvije su bile totalna katastrofa. potpuno su popucali i rasvjetali se. moj je zakljucak da esencije ili tekuce boje im to naprave. mislim da dodatak kakaa je malo zgusnuo smjesu pa su ljepse ispali. ovi na slici lijepo izgledaju. e, da, ja ih volim. u stvari volim taj okus badema i to sto su pomalo "chewy". priznajem da su dosta slatki ali su mi fini. Zamislite i ja sam ih pravila! Mogu reći da sam zadovoljna. Ja sam ih pravila onako bijele bez ikakvih dodataka i jednu količinu s kakaom i jednu količinu s čokoladom u prahu. Ne volim nikakve boje u kolačima. To su lijepi i ukusni kolači. Pravila sam ih po receptu s bloga Da mi je nešto slatko. Ima jedno ali... Pogađate: puno truda za malo kolača! Pojedoše moji dečki to dok si rek´o keks! Stvarno su ukusni i lijepi al´ malo! Ovi tvoji su zbilja prekrasni a slike prelijepe! meni oni izgledaju prelijepo, ali ni ja baš nisam sigurna u okus... puslice su mi ok, ali definitivno su preslatke... a da ovo isprobam, morala bih biti jako autodestruktivno raspoložena, što gotovo nikad nisam :)) fotke su mrak! Your beautiful macarons are so perfect! I love your choice of filling! That color is unreal! It's gorgeous! The macarons are so cute! You may not be keen on them but they look perfect and such a pretty colour too! Maybe the filling reacted with the shell which is why they melted. 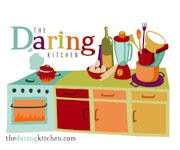 Izgleda po ostalim postovima Daring Bakers-a da je recept katastrofa jer nikome nisu uspjeli. Jedino Tartelette nije imala problema, ali iza nje je petnaestogodišnje iskustvo,avrlo vjerovatno i profesionalnu kuhinju. Molim vas, moze li mi neko reci sta je ovo "almond flour"? Ja također mislim da su macarons precijenjeni što se okusa tiče, a izgledaju stvarno prelijepo, šareno i primaamljivo. Jednom sam ih probala raditi, naravno nisu mi uspjeli, nakon silnog truda samo te bace u očaj... A što se okusa tiče ne kažem da nisu fini, ali ljubiteljima puslica jer se nademi gotovo ni ne osjete, tako da je okus preslatka puslica sa u mom slučaju gorkastom kremom od čokolade, iskreno puno su mi bolji neki kolači koje doslovno smučkaš i izliješ u pleh... Tako da ne kužim po čemu su stekli toliku popularnost. I love how honest you were in this post. 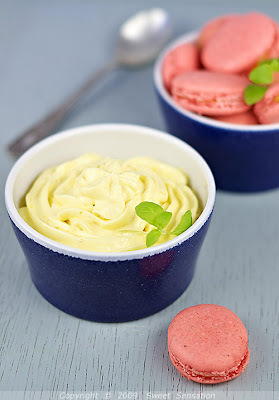 It does seem that macarons are simply everywhere in food blogs these days, so I think you took a brave stand in telling the truth about not really caring for them. Bravo! I want not approve on it. I over precise post. Expressly the title attracted me to read the unscathed story. Good fill someone in on and this mail helped me alot in my college assignement. Thanks you as your information. Brim over I assent to but I dream the brief should acquire more info then it has.